Catch Some Zzzzzzz’s – Sleep Tea is blended to chill you out and help you get to sleep. 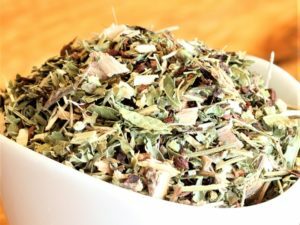 The kava kava and valerian in this blend are known to help you relax and avoid insomnia. Chamomile is a known sleep aide and adds a little sweet apple flavor. Rose is known to help you relax, while lemon balm helps with anxiety. Both rose and lemon balance the intense flavor of valerian. Our customers swear this tea blend helps them get to sleep. They claim it’s relaxing and gets them to that sleep state faster and drug free. Find this blend at our tea bar in Missoula, Montana or buy online! Kava kava, valerian, chamomile, rosebuds, rosehips, and lemon balm. I have shared this tea with a few of my friends and family who struggle to fall asleep, and they were amazed the tea worked from the first cup. I drink this tea every single night and the kava kava really helps me relax and drift off. It does have a bit of a strange odor – which worsens after you steep – but the flavor is mild and smooth, and I enjoy it very much. I travel with it as well – it is so much healthier than sleeping pills! Thank you for your feedback, Lisa. We use powdered kava kava for its potency, and glad it works for you and others. Iv always had trouble sleeping until I started drinking this tea. Helps me sleep great at night. Thanks for sharing your feedback on Catch Some Zzzz’s. Glad it helps!